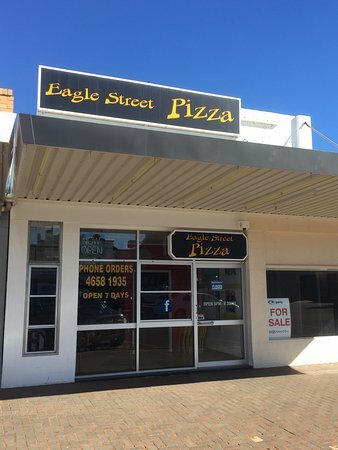 There aren't enough food, service, value or atmosphere ratings for Eagle Street Pizza, Australia yet. Be one of the first to write a review! Ok pizza, Super Unfriendly Staff! Affordable pizza deal for delicious pizzas. Ready in 15 minutes full of flavour and topping. 2 pizza deal was fantastic. Great option for any family. Surprising variety and quality. We tasted a variety of 7 different pizzas. The garlic aoli pizza was amazing. Must try if in Longreach. Great value for a quick meal. Pizza, garlic bread and drink for $20. Just as good as city pizza but more toppings. Enjoyed the vegetarian pizza so much we had it twice in four nights. Not the most enticing shop front, so we were a little dubious at first, but glad we tried it. We rang and ordered a take away it was ready in 20 minutes. It was a very tasty Pizza and Garlic Bread. We selected the Pizza Garlic bread and 1.25 soft drink for $20.00, great value for money. Get quick answers from Eagle Street Pizza staff and past visitors. I think they will because they do deliver. Don't wait until your really hungry though.